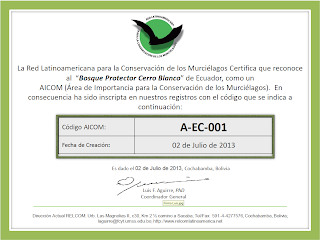 On the 2nd July 2013 the Latin American Network for the Conservation of Bats (Red Latinoamericana para la Conservación de los Murciélagos) - RELCOM, declared the Bosque Protector Cerro Blanco in Guayaquil an Area of Importance for Conservation of Bats (Área de Importancia para la Conservación de los Murciélagos) - AICOM. 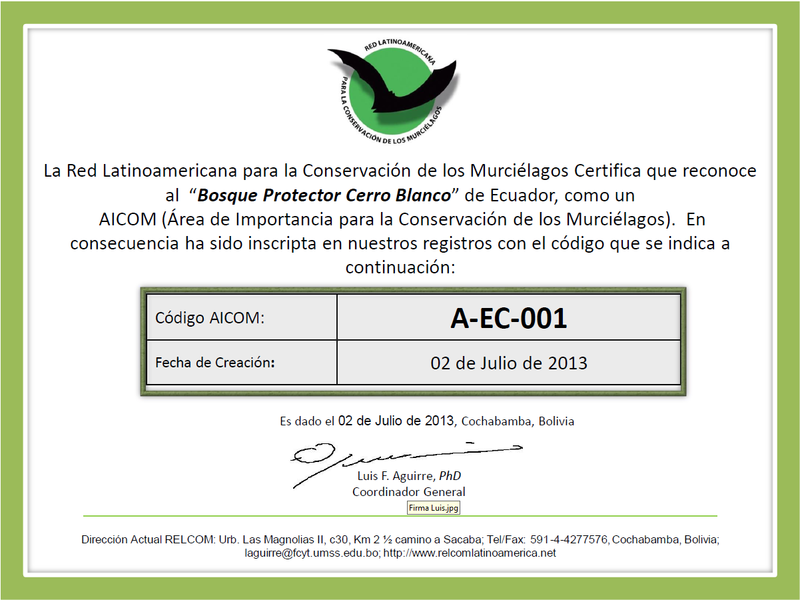 The Bosque Protector Cerro Blanco is the first Ecuadorian reserve to be accredited with an AICOM. Previously the Cuevas de San Antonio de Pichincha, in the Pichincha province, had been declared a Place of Importance for the Conservation of Bats (Sitio Importante para la Conservación de Murciélagos) - SICOM, but this is the first nomination and declaration of an AICOM for the province of Guayas and Ecuador as a whole. These are the only two reserves in Ecuador that have been recognized for their efforts in the conservation of these flying mammals. One of the more unique species of bat found at Cerro Blanco is the Noctilio Leporinus (Fisherman bat), which uses it power to fly low over the water to catch fish. 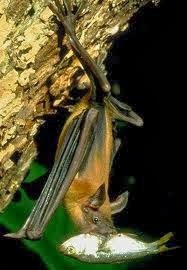 Its is estimated that this bat can catch 30 or 40 fish of up to 80mm in length in a single night. Since 2007 the Fundación Pro-Bosque at Cerro Blanco has dedicated much effort towards the conservation of bats, with the Biologist Jaime Salas creating an inventory of species found at Cerro Blanco, and the Graduate Leonardo Álava, maintaining and updating it. The have also developed an educational program for school children, including the construction and strategic placement of wooden roosts for bats, and the distribution of a bat comic.